Over four hundred years ago an event of singular significance in the history of California occurred in the waters off Pt. Reyes. In what is today known as Drake’s Bay, north of San Francisco twenty five miles, the Manila Galleon San Agustin was wrecked, the captain and crew suddenly marooned. Ironically the ship and crew were engaged in exploration to find a safe and secure harbor along California’s unknown and treacherous coast. The survivors eventually reached Acapulco, Mexico, in an open plank boat, charting the coast as they sailed–an epic journey in its own right. What has long eluded scholars are the precise details surrounding the loss of the ship; details which might point towards the location of the vessel’s remains. Missing from contemporary documentary material is information relating why the San Agustin wrecked and how.A survey of the literature finds at least six different descriptions of the San Agustin’s loss, and each term or phrase encompasses a different set of circumstances and assumptions. Was the ship run aground as one author has described, or did it capsize while in deep water? An understanding of the wrecking circumstances is important for determining site formation processes, the location of the ship, and for making reasonable assessments of the extent of the vessel which may remain. Each wreck-event has characteristic patterns of destruction and will leave a distinctly different archaeological fingerprint. The principle document used by all previous investigators is the Relation of Sebastian Cermeño (Archivo Generale de Los Indios 1596), Captain of the ship, but the loss of the ship is mentioned only a single time, in a non-descript and unenlightening manner. There are, however, other cartas which allude to a separate testimony, as well as comments in letters from another explorer, Sebastian Viscaino, who sought to recover the ship’s cargo in 1602, indicating the existence of commentaries pertaining to the San Agustin. There also exists a letter to the Viceroy in Mexico relating a survivor’s account stating the ship “struck and went to pieces,” among documents of the Sutro Collection (Donald Cutter 1969). To understand why the San Agustin was exploring California’s coast we must reach back further in time to the 1540s. Spain’s efforts to expand its empire to the Far East and to capitalize on the riches of the spice trade were the impetus behind astonishing sea voyages from South America and Mexico across the Pacific to the Philippines. Initially Spain was locked out of the lucrative trade with China, Japan, India, and the true Spice Islands, the Moluccas. A series of Papal Bulls beginning in 1493 had granted these regions to Portugal. Nevertheless, Spain sought to exploit the Philippine Islands, which originally fell within the Portuguese sphere of power. The Philippines had limited resources, and were basically ignored by Portugal. Spain managed to establish a fledgling colony at Manila. The location was well situated to become the preeminent entrepôt for the region (William Schurz 1911; Lopez 1977:10). The earliest voyages from Mexico to reach the Philippines were met with failure. Although navigators were successful crossing the Pacific, they had no known return route, and on arriving were harassed by the Portuguese, who viewed any Spanish presence with suspicion, and not infrequently, resisted such interlopers with canon fire. It was not unusual for Spanish crews to end a perilous Pacific sea voyage in prison. In 1565 Francisco de Salcedo, and Andreas de Urdaneta, successfully returned to Mexico, sailing in the northern latitudes from the Philippines. With this voyage the Manila trade was born. Several times during the early years of the trade the colony approached collapse due to the lack of supplies, and from the constant raids by Morro pirates (Schurz 1932). Numerous Relations among the documents in the Archivo Generale de los Indios, in Seville, by mariners and officials, testify to the problem these pirates posed to the colony. From 1565 until 1815 Spain would maintain this commercial route linking the Philippines with Mexico. That this navigation should continue for 250 years is all the more remarkable when we consider it is one of the longest and harshest routes ever navigated, often lasting seven months or longer. After departing Manila the ships had first to negotiate the reefs, shoals, and islands of the Philippine archipelago. This was the most dangerous part of the voyage. Navigators then had to climb north to latitudes of 42 degrees and higher where they would enter currents and winds that would drive them east towards the Pacific Northwest of North America (William Schurz 1932, Del Portillo 1982:172-177). After months at sea the ship eventually encountered signs that the coast was near: seals, shorebirds, floating kelp, and driftwood. Anxious of navigating closer to the fog enshrouded coast, mariners headed the galleons south at these first indicators of the mainland, with another 2000 miles of sailing ahead. The Spanish mariners had good reason to fear the coast; northern California is guarded by rocks and cliffs. The wind and current that had brought the ship across the sea now threatened to drive it ashore. At this juncture of the voyage food and water were generally depleted, the crews suffering from serious deprivations, disease, scurvy, or exposure in the northern climates. The economy of Manila was entirely dependent on the success of the voyage. Nearly everyone in the colony had a stake in the cargo being shipped from the Philippines to Mexico. Records indicate that as many as three ships might make the voyage in a given year, however, the general rule was that one ship annually sailed the route. William Schurz (1911) calculated that in the 250 years of this route, one out of every fifteen ships came to grief, some forty in the first 200 years, most in Philippine waters. Along California’s coast there are known to be at least two galleons wrecked and possibly four, in addition to the San Agustin. It is likely that in each case the crews were unable to respond to emergencies due to their weakened condition. Merchant interests in Manila and their agents in Spain argued continuously for the Crown to sponsor a voyage of exploration along California to locate a safe harbor in which the manila galleons could find refuge, take on fresh water, and restore their depleted foodstuffs. It was not concern for the crews, but worry over the loss of cargo, and economic ruin that inspired such arguments. The cargo of a manila galleon was the very lifeblood of the colony. The Crown was slow to respond to these entreaties due to political pressure from Andalusian merchants who were bitter over competition, especially in the luxury textile market. Finally persuaded, the Crown, in 1595, directed the governors in Mexico and the Philippines to secure the service of a ship and navigator to carryout the exploration. Sebastian Rodriguez Cermeño, a Portuguese pilot, was appointed the task. According to documents in the archives of Seville, and once held in the Sutro Collection (Cutter 1969) Cermeño was selected as much for his skill as the fact that no Spaniard with the skill was available. Cermeño sailed from Mexico in the ship San Pedro in 1594, and for reasons not entirely clear, upon reaching Manila, changed ships for the return navigation. The San Agustin was a small vessel of some 200 tons burthen. The San Agustin set sail in July of 1595 in the company of two larger galleons, the Margarita and the San Felipe. All three ships carried the usual cargo bound for Mexico. The manifest of the Margarita and San Felipe are in the archives but the manifest of the San Agustin is conspicuously missing. We are assuming here that, with minor differences, the cargo of the San Agustin was of similar composition as the other ships. At the first signs of the California coast, following an uneventful crossing of the Pacific, the San Agustin parted company from the other two ships. Cermeño’s detailed account of events leading to this position are clear enough to establish that he was indeed near the Limintour spit that juts out in front of Drakes Estero. However he is absolutely mute on what happened next. It seems that Cermeño had intended to use this bay as base of operations and had ordered the crew ashore to assemble a plank boat, which had been transported disassembled, to be used for in-shore exploration. With nearly all the crew ashore exploring, the ship was inexplicably wrecked (Henry Wagner 1924:5). 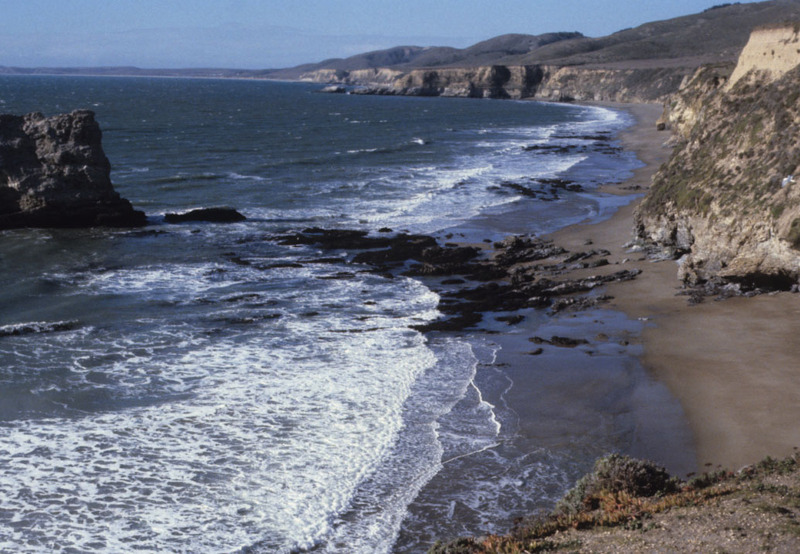 In these waters just north of San Francisco Bay are the remains of California’s oldest recorded shipwreck. One or two older may be on the bottom near the Channel islands or possibly in Alta Baja. After the loss of the San Agustin the small open boat they had been constructing was the only means for continuing to Mexico. Cermeño carried out his orders by making an epic voyage back to Mexico in this boat, charting the coast as he went. The boat was not as crowded as might at first seem. Several of the crew refused to sail with Cermeño, whom they blamed for their predicament, electing instead to walk back to Mexico! They all eventually succeeded, and were summarily arrested as mutineers. The significance of their journey is obvious. These men could not have avoided discovering San Francisco Bay as they marched south. Why Spanish authorities did not act on this information is unknown. Or, perhaps their stories were behind Viscaino’s keen interest and urgency to explore the coast northward from Mexico. It is also likely authorities imagined their tale a conspiracy to avoid prosecution. Cermeño’s first stop was the Farallon islands, about twenty five miles southwest from Pt. Reyes (AGI 1596). This decision took him out to sea and prevented his discovery of the mouth to San Francisco Bay. Continuing south, Cermeño mapped Monterey Bay and San Pedro harbor in San Diego, before finally arriving at the port of Navidad (Cutter 1969). The loss of the ship convinced Spain to steer clear of the coast, a fact that spared native populations from European contact for many generations. The loss also led directly to a policy of land oriented rather than sea borne exploration (Del Portillo 1982). As a result, the San Francisco Bay would not be encountered by the Spanish for another one hundred eighty years, when it would at last be seen from the East Bay hills during the Fages expedition in 1775. The slow expansion northward in California by the Spanish opened a window of opportunity for English and Russian encroachment in the Pacific Northwest. Point Reyes juts out westward, forming a peninsula, providing a gently curving land mass against winds from the north. The bay however is for the most part an unprotected open roadstead. The Inverness Ridge rises sharply along the eastern boarder. Wide beaches abut steep cliffs which rise eastward from the beach more than one hundred feet except at the opening of an estuary. The mouth of this estuary is protected by an ever changing sand bar; the Limintour Spit. The physical environment was thoroughly detailed by the National Park Service (Larry Murphy, et al. 1982). By their assessment it is difficult to know where the beach was 400 years ago. It is possible that the beach was further west and south as much as 500 feet from its present position, the change due mainly to the erosion of the cliffs. Aside from the detailed account by Cermeño describing his anchorage, we know the San Agustin is wrecked in Drake’s bay from more tangible indicators; sherds of Ming Dynasty porcelain periodically wash up on the beach. Drake had off-loaded a considerable amount of ceramics during his brief stay in 1579; ceramics pirated from Spanish ships, but Edward Von der Porten (Von der Porten 1972; Shangra and Von der Porten 1981) has convincingly distinguished between Drake era porcelains and Cermeño porcelains by paste, temper, design, and wear patterns. Both are present in native middens but can be easily distinguished. Modern interest in the San Agustin can be traced to Hubert Bancroft (1886:96-97) who briefly discusses the fate of the vessel in his classic History of California. Bancroft evidently was not using primary source materials and flatly states that he believes the ship was not wrecked, and that only some cargo was lost. He probably was misinterpreting statements made by Sebastian Viscaino who undertook a voyage in 1602 to locate and salvage the cargo of the San Agustin. That Viscaino believed it would be possible to salvage the ship is relevant to our research. His pilot, Francisco Bolaños, had been a crew member of the ill fated San Agustin. (Wagner 1924). Viscaino’s comments are crucial. His own comments allude to statements by other mariners; and refers in such a matter of fact manner to information not contained in the Cermeño document, that we are left wondering if other documents once existed that pointed more clearly to the wreck site, which have not survived. The most comprehensive work directly relating to the San Agustin was carried out by Henry Wagner (1924). Writing for the California Historical Society, Wagner provided the translation of the Cermeño document, generally maintained to be the most authoritative. Several researchers have relied on the Wagner translation. Wagner also devised a means of assessing Cermeño’s navigational skills and has correlated a number of his bearings and coastal descriptions with identifiable locations on California’s north coast. Raymond Aker of the Drake’s Navigators Guild has synthesized Wagner’s work into a useful form for conducting a survey. Aker’s work formed the foundation of the work conducted by the National Park Service (Murphy 1982:30). A limited survey was begun in 1965 by John Huston of San Francisco and Paul Schumacher of the NPS, but was not carried to completion. Robert Heizer (1941) adopted a land based approach to the San Agustin question. Heizer relied heavily on the Wagner translation in trying to locate Cermeño’s encampment. 1982 was the year that the Submerged Cultural Resource Unit under the direction of Larry Murphy conducted an extensive electronic remote sensing survey of Drake’s Bay. Making use of Aker’s synthesis of navigational directions for determining the wreck site, several probable locations were surveyed and mapped using a magnetometer. Divers found no visible traces (Murphy 1982). In 1987 treasure hunter Robert Marx began to show considerable interest in the wreck. Marx sought, and received, permission from the state to locate and salvage the vessel. Fortunately, the wreck is held as tightly to the sea bottom by bureaucracy as by any gripping sand. The location of the San Agustin falls under the jurisdiction of several state and federal agencies, including the National Park Service, NOAA, and the State Lands Commission. Marx’s interest was met with acrimony. One NPS official at the time threatened to “put the cuffs” on Marx if he so much as set foot on park property. The local press reveled in the “news” of treasure so close by. Public hearings concerning permit granting were sponsored by NOAA in 1987. Despite a great deal of early publicity garnered by Marx from a sympathetic reporter, and an abortive survey in the bay, nothing came of these efforts. His permit was not renewed after 1989. In 1987 the San Agustin Institute of Marine Archaeology was founded as a non-profit, research, and public education organization. The institute’s stated mission included the intent to find and carry out research on the San Agustin. The institute has conducted several public lectures relating to the vessel and its importance to California history. During a short field season in 1995, archaeologists from Sonoma State University attempted to locate the encampment of the San Agustin’s crew along the estero, following up on Heizer’ work. In the past decade the State of California has changed its policy fundamentally concerning the status of shipwrecks and has taken a leadership role in the protection of submerged cultural resources. What could we expect to find at this site? If the analysis of Henry Wagner and Raymond Aker are correct, the San Agustin was anchored in a sandy bottom some 300 yards from the mouth of the estuary, due west. If the vessel was blown shoreward, prevailing currents might also have helped drive the vessel towards, and south, of the sand bar. The ship would then have been grounded and turned parallel to shore to be pounded by the surf. Cargo stacked on deck would have immediately been washed overboard. Did the vessel break up? Was the ship overturned and dragged into deeper water? We don’t have adequate information. We can speculate that the ship was broken up close to shore and the cargo spilled into the sandy bottom. The superstructure was undoubtedly carried away. Viscaino could find no trace of the ship only a few years later. The ship might have dug into the sand, and been buried deep below the seabed. Some timbers may remain beneath ballast. Canon may also be present. By 1595 the Pacific was no longer a Spanish lake. Raids by English privateers Francis Drake and Thomas Cavendish were within recent memory and the Crown had ordered that ships be armed. However, Schurz (1932) reports that the common practice was to store the guns below making more room available for cargo. If so, the guns might be in place with the ballast and may account for the magnetometer contacts made during the NPS 1982 survey. A letter dated to June of 1596 states that the San Agustin carried 130 tons of cargo (Wagner 1924). The cargo of the San Agustin was mostly textiles, and Ming Dynasty trade porcelains, bound for Spain, but also blocks of wax, cordage, spices, rare woods, exotic manufactured goods from China. The ceramics and textiles were transported in special containers designed for the purpose. Cottons and lesser grade fabrics were bundled and baled (medio fardillos) and only occasionally boxed. Finer fabrics were packed tightly in half chests (medio cajones) and included taffetas, silks, and damasks. Ceramics were transported in barrels, and were of several vessel types. Spices were bagged, and wax was transported in cakes of up to a hundred pounds or more (Carmen Yuste Lopez 1977:26). There were also ceramic vessels for storage of foodstuffs. The excavation of the Nuestra Senora de Concepcion, which wrecked in Saipan in 1638 offered a glimpse of the types of containers and goods transported by Manila galleons (Mathers 1990). The Concepcion contained a cargo not unlike that listed for the Margarita or San Felipe, and likely for the San Agustin as well. There is some expectation therefore that significant diagnostic material remains. A wealth of artifacts may be buried in the Drake’s Bay sands. In 1996, an exciting new union developed. Representatives from several private and academic institutions have met to explore the possibility of a collaborative effort to find, excavate, and conserve the San Agustin. The San Agustin Institute, the Drake Navigator’s Guild, and archaeologists and historians from the University of California Berkeley, Stanford, and San Jose State, recently agreed in principle to create a consortium. The State Lands Commission and the NPS were invited to lend support. The goal was to bring together agencies that at one time were at odds with one another into a collective. It takes very little imagination to realize what a monster this creation might become without careful planning. Determining principal investigator, funding, conservation, long range project development, all were under discussion. The wreck of the San Agustin offers a rare and unique opportunity. The significance of the San Agustin to California history is undeniable and palpable. It is the earliest documented shipwreck on the Pacific Coast. More importantly to nautical archaeology, the San Agustin is a manila galleon, a ship type for which there are no extant plans, and only limited examples from the archaeological record (L’Hour 1994) The discovery of this vessel could add tremendously to our knowledge of ship technology and the shipwright’s art during the late sixteenth century. Manila galleons were the workhorses of the Pacific. Many were built in the Philippines and may reflect unique traits and adaptations in ship technology, or might reveal accommodations to the constraints imposed on a distant and poorly supplied colony. The place that the San Agustin holds in California history can not be ignored. The loss of this single ship influenced Spanish policy towards California, slowing encroachment for generations. Study of the cargo would increase many fold our understanding of the Philippine trade and the commerce of Spain’s far reaching empire. The remains of the ship itself would contribute fundamentally to our knowledge of maritime technology and design from an era of which our knowledge is seriously weak. If we ask the right questions of the material remains, we may also increase our understanding of the diverse ethnic groups that served on these commercial ventures. The explorers and the crews were not all Spanish or European, and these diverse individuals constitute the first cosmopolitan communities. Without doubt, finding the San Agustin will offer unique research possibilities for years to come. I would like to thank James Delgado, Edward Von der Porten, and Peter Pelkhofer for comments and suggestions concerning the final version of this paper. I further wish to extend my gratitude to Michel L’Hour for information pertaining to a Manila galleon recently investigated in the Philippines, which undoubtedly serve as an example for comparative study in the future. 1886 History of California Vol.1 The History Company, San Francisco. 1596 “Relacion de descubiermientos en California de Sebastian Rodriguez Cermeño, 1596” Audiencia de Mexico 23 doc. 50c. Archivo Generale de los Indios. Seville, Spain. 1969 The California Coast: Documents of the Sutro Collection. University of Oklahoma Press, Oklahoma. pp 28-117. 1982 Descubiermientos y Exploraciones en Las Costas de California 1532-1650. Ediciones Rialp, S.A. Madrid. 1941 “Archaeological Evidence of Sebastian Rodriguez Cermeño’s California Visit in 1595” California Historical Quarterly 20(4):315-328. 1994 Un galion de fortune, in Le San Diego: Un tresor sous la mer. Exhibition Catalog. Paris, Editions Carre. Pp118-153. 1990 “Nuestra Senora dela Concepcion” National Geographic 178(3):39-52.September. 1982 Submerged Cultural Resource Survey: Portions of Pt. Reyes National Seashore and Pt. Reyes-Farallon Islands National Marine Sanctuary. US Department of the Interior. 1911 A Study in the Beginnings of Trans-Pacific Trade. Unpublished Masters thesis. University of California. Berkeley, California. 1932 The Manila Galleons. New York. 1981 The Drake and Cermeño Expedition Chinese Porcelains at Drake’s Bay, California 1579 and 1595. Drake Navigator’s Guild and Santa Rosa Junior College. Santa Rosa, California. 1972 “Drake and Cermeño in California: Sixteenth Century Chinese Ceramics. Historical Archaeology. 1-23. 1924 “The Voyage to California of Sebastian Rodriguez Cermeño in 1595” California Historical Quarterly 3(1):3-24. April. 1977 El Comercio de la Nueva España Con Filipinas 1590-1785. Instituto Nacional De Anthropolgia E Historia. Mexico.